Many of you are accelerating your digital transformation by running your SAP environment faster, more securely, and more cost-effectively on AWS. By doing so, you benefit from the scale and performance of AWS. However, while your SAP environment may be on AWS, many of your users might still access it through SAP GUI on local computers and local networks, which can create a few challenges. For example, users running SAP GUI on their desktops and moving large amounts of data to and from your SAP environment on AWS could experience higher latency and a slow application experience. At the same time, SAP administrators still have to manage SAP GUI on-premises on each user’s computer to make sure everything is up-to-date with the latest security patches. So, while your SAP environment benefits from running on AWS, there are ways to further improve your users’ experience by running SAP GUI on AWS. 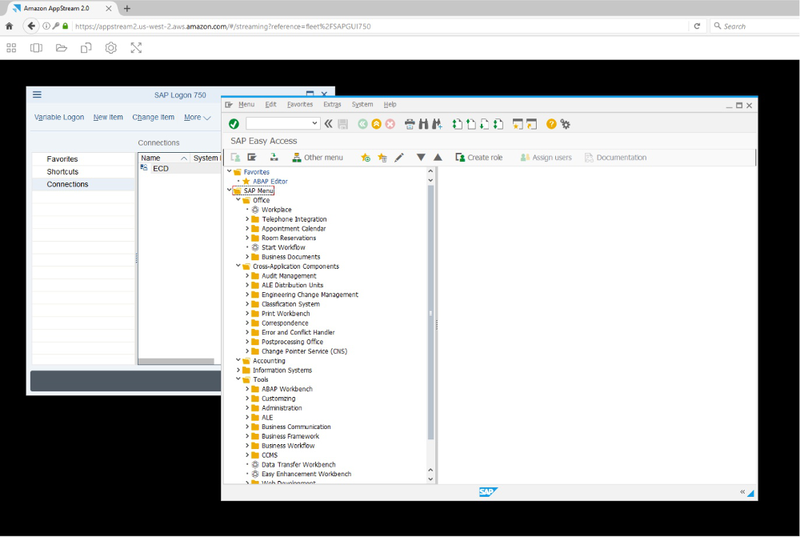 Today I’m excited to announce our SAP GUI Deployment Guide to deploy SAP GUI on Amazon AppStream 2.0 and help address these challenges. AppStream 2.0 is a fully managed application streaming service that provides your users secure access to your SAP environment through a browser on any computer, including PCs, Chromebooks, and Macs. Deploying SAP GUI on AppStream 2.0 provides your users many of the same benefits your SAP environment receives on AWS. To start, your users can move faster. Because SAP GUI runs on AWS next to your SAP environment, your users don’t need to upload or download data from AWS, and the application feels more responsive. At the same time, AppStream 2.0 makes it easier for you to manage SAP GUI for your users. With AppStream 2.0 you centrally manage one version of SAP GUI and stream that exact version to every user. Users only access up-to-date versions of SAP GUI, and you don’t have to deploy updates to every user’s computer. And, your applications run on AWS next to your data so nothing is stored on your users’ computers. You can restrict access to your existing local network, and manage user access with your existing Microsoft AD credentials. Finally, AppStream 2.0 is fully managed on AWS. This means AppStream 2.0 manages the AWS resources required to host and run your SAP GUI and related applications, scales automatically, and delivers your applications to your end users on-demand with simple pay-as-you-go pricing. You can read our customer testimonial by COREXPERT by TEAMWORK to learn how they deployed SAP GUI for every user in under two days. To get started with your own deployment, download the SAP GUI Deployment Guide.